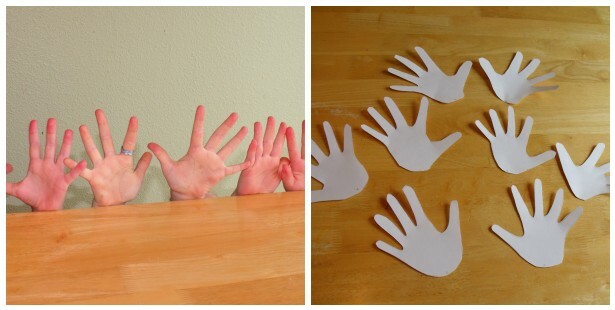 We are still on spring break around these parts and still on the lookout for fun crafts we can do with the kids. Then I remembered a cute flower craft we did a couple of years ago from family fun magazine where you use hand prints to make beautiful spring lilies. Next you want to take a pencil and curl the fingers around it to make the "petals"
Next you want to make the leaves. First make a template out of left over card stock. I made it the same length as the straw. Once I had a template I traced it multiple times on the paper. 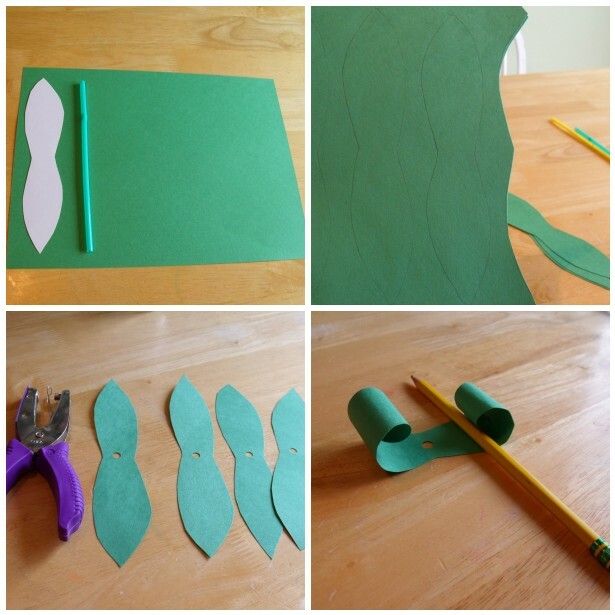 Here's a tip if you are doing multiple kids and flowers: Put a few pieces of green construction paper together (I did 3 at a time) and cut multiple leaves out at once. It's a real time saver! Next use a hole punch and make a hole in the center of the leaf shape. (Make sure to make the leaf wide enough so there is room for a hole). Take your pencil and curl the edges of the leaves like you did with the finger petals. Now for assembly: Fold the hand flower around the straw stem. You want to make sure the curly fingers are pointed out. Tape both the flower ends together and to the straw at the same time. You can use more than one piece of tape. 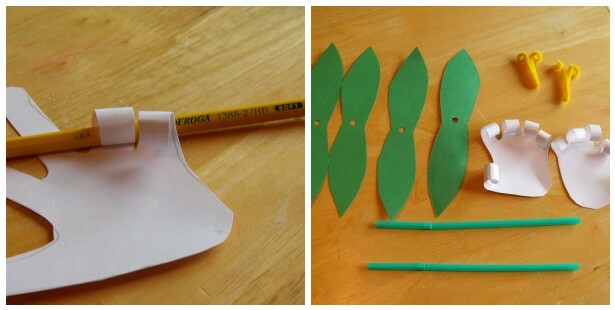 Attach two leaves with the curl going down and make an "X" shape with them. 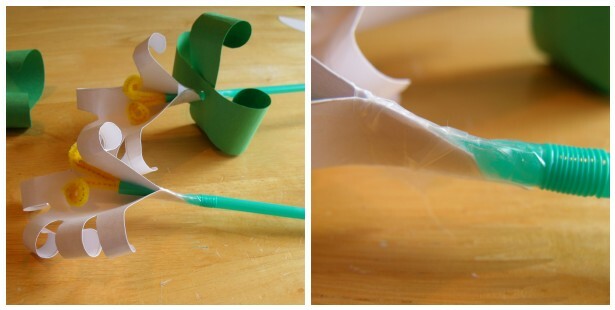 Take some more scotch tape and wrap around the straw underneath the leaves so they can not slide back down the straw and to hold them in place. Take a yellow pipe cleaner and fold it in half. Cut it. Now take each half piece and fold in half again to make a "V". Curl the edges around a pencil to give it a stamen look. Insert the yellow "V" shaped pipe cleaner down into the straw to complete the flower. Make a bunch and place them in a tall pretty glass or small vase and display them on your Easter table. Also would make a lovely gift for moms, grandparents or teachers. I was also thinking you could make these in multiple colors and give them on May day and Mother's day too! I like how these look on our dining table, plus they never seem to wilt! Hard Boiled Eggs - in the OVEN?